If you put it in a bowl and eat it with a spoon, is it soup? Possibly, or, it might be stew, cereal, pudding… what makes soup actually soup? She calls this “soup”, so it must be. When I first read the recipe I wasn’t sure if it was a starter, dessert, or maybe breakfast. I’ve now enjoyed it as all three and what I can tell you is, soup or not it sure is good! I made a few changes, of course, but overall I’ve stuck with her original recipe. I thought I had some fig vinegar but I couldn’t put my hands on it so I used lemon balsamic. Also, I added a few mint leaves to the mix. I mean, it’s summer in Texas after all, and what’s more summery than lemon and mint? Note: The only difficult thing about this is the waiting. Trust me, though, it’s worth it! 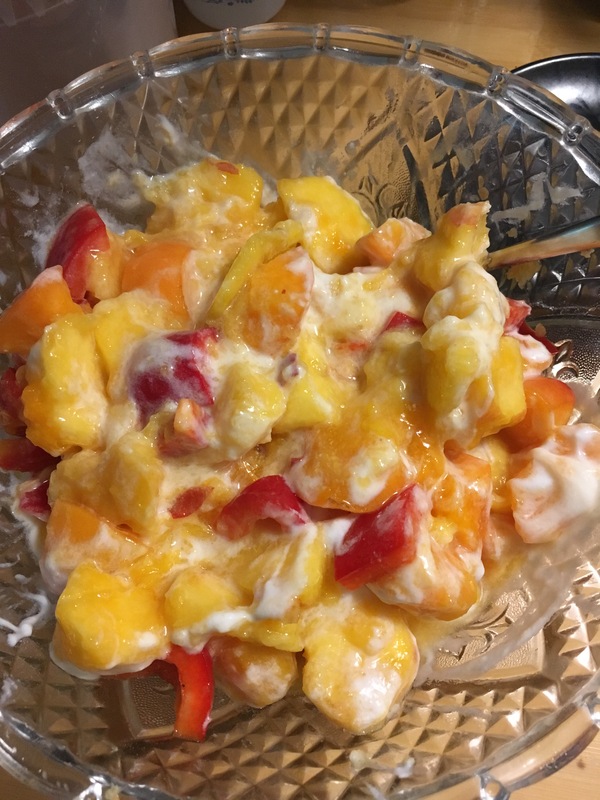 Macerate the peaches, pepper, apricots, ginger, honey, salt, balsamic or fig vinegar, and half the yogurt in a bowl overnight, refrigerated. Transfer the contents to a blender or food processor and puree until smooth, adding the remaining yogurt and enough water to reach a velvety, silky consistency. Season to taste with salt and additional honey or vinegar. Refrigerate to chill, for about 1 hour. Pour the soup into shallow bowls and garnish with a drizzling of honey, fresh mint and a pinch of pink peppercorns. Note: You can also sprinkle a little Greek feta or manouri cheese on top, or serve with a dollop of Greek yogurt. About those asterisks above. *If you can’t get decent fresh peaches, you could use frozen or even (gasp) canned. Ginger, same – if you can’t get fresh you can certainly use powder. **You can definitely make this with dried apricots. I know this is true because my sister did and it was fine. Just chop ’em up. ***I cut the honey to 2 tablespoons and it was still plenty sweet. If you don’t have Greek honey, any good local honey is fine. **** I skipped these entirely and didn’t miss them. Oh, and I left the salt out. Also, I recommend sweet red bell pepper for the color. The final result is so pretty! Use what you can find – the yogurt doesn’t have to be Greek any more than the honey does. I’m currently keeping a bowl of the macerating “fixings” in the fridge and having “soup” for breakfast until it runs out. Then I’ll start over (and over and over) until the relentless Texas summer breaks. So, when is a soup not a soup? 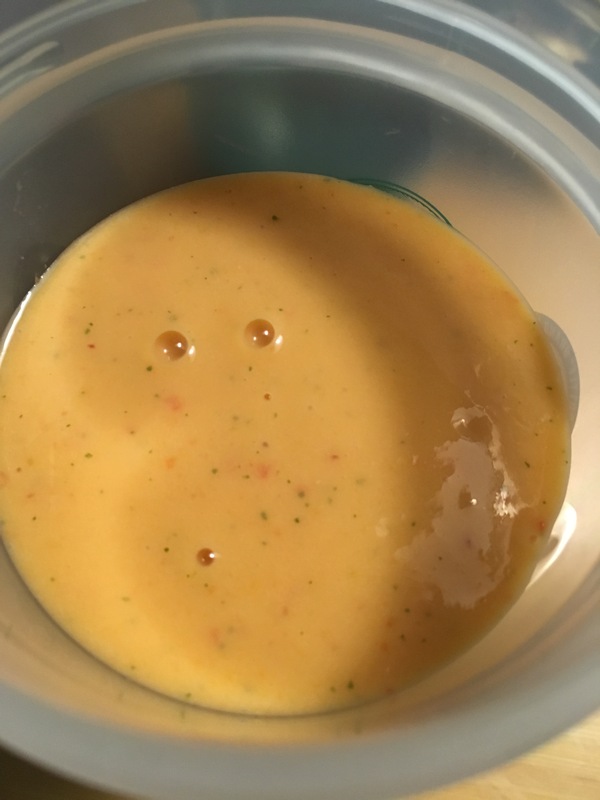 When its a smoothie! Mmmmmmmm…. Enjoy and stay cool!